I realize that it has been quite a while since I have done a recipe post. I have actually taken pictures of food as I am making it in hopes of blogging them, but life, laziness and procrastination have all taken over. Shocker. 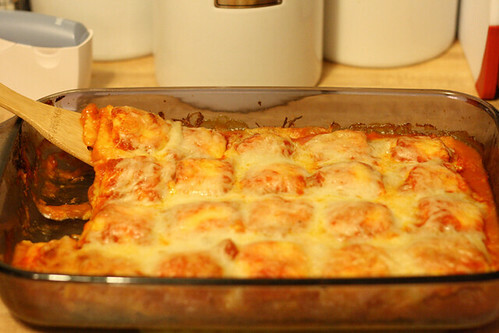 Today's recipe is Baked Ravioli. My husband practically lived off of Chef Boyardee Ravioli for YEARS. Soon after we good married we stopped buying Mr. Boyardee and my poor hubby started missing his ravioli fix. Seeing as how he was out of the canned ravioli phase I decided to try baked ravioli. And boy howdy am I glad I did. Everyone in my family loves it. Its an easy meal and it happens to be one of the few meals Zachariah will eat! Talk about a win win scenario. Ok! Lets get down to business. Here are the ingredients. All three of them. 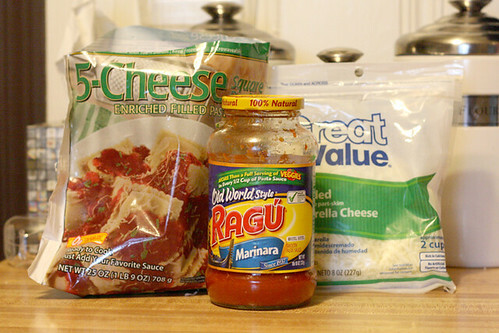 You need a bag of frozen ravioli, a jar of marinara sauce and shredded mozzarella cheese. Talk about a simple meal! 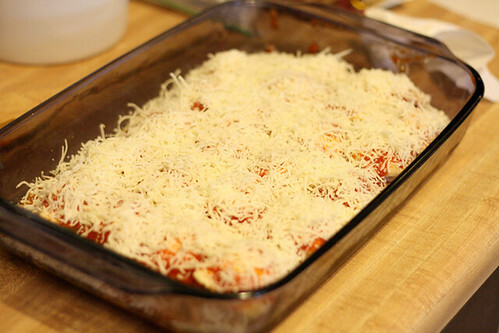 Cover the bottom of a 9x13 dish with marinara sauce. Don't coat it completely, just put enough sauce down so the ravioli wont stick to the pan. Then lay one layer of frozen ravioli pockets on top of the sauce. Cover the layer ravioli pockets with sauce and then top it with about half of your mozzarella cheese. Then start over! 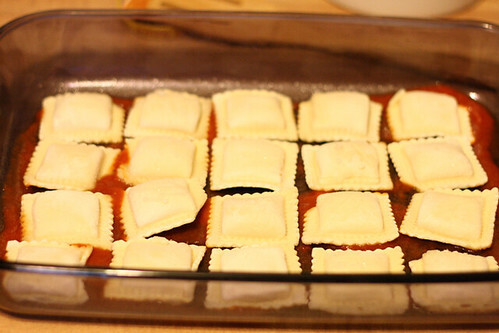 Place frozen ravioli on top of the cheese, then cover in sauce and put more cheese. 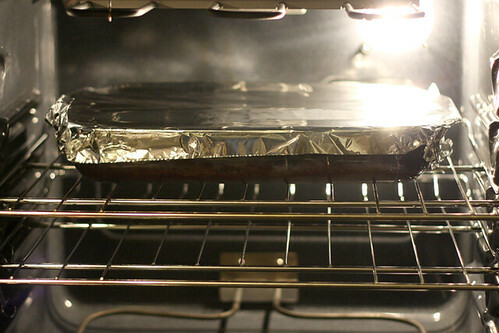 Once the oven has preheated to 400 degrees, cover the pan in foil and let it cook for 30 minutes. After about 30 minutes, take the foil off and cook it for another 10 or 15 minutes. I usually take it out after 10, but if it looks soupy and it isn't starting to burn go ahead and leave it in for a little bit longer. Wala! The finished product! Does that not look delicious? Serve this with Italian bread and a salad and you will be set! Heat oven to 400°F. Spray bottom and sides of a 9x13 rectangular baking dish with cooking spray. Cover with aluminum foil and bake 30 minutes. Remove foil; bake uncovered 10 to 15 minutes longer or until bubbly and hot in center. Let stand 10 minutes before serving. lol raine, i didn't even notice the oven until you said that. Amy Lynn-that is one shiny oven! Amy Lynn- this looks delish! Can this be made in advance and frozen? Did you make this the freeze it? I am looking for freezer friendly ideas. Awesome recipe! Love that it's only one pan! Made this last weekend and it was great! Hubby has requested it for tonight! So easy and so tasty. Gives the ravioli a homemade texture!! i made this tonight and it was great. i added hamburger & garlic to the sauce & used about twice as much sauce as it called for. my family loved the extra sauce to dip their bread in. mmmm, mmmm good. thanks for the recipe. Does it make a difference if you use spaghetti sauce? I picked up that instead of marinara. I think I'll try a version of this... instead of mozz between the 2 layers of raviolis, I'm going to make mixture of (thawed) frozen chopped spinach and ricotta cheese. Looks excellent, great idea, will try this with my homemade sauce, but thank you for sharing a great idea!! Instead of spaghetti sauce or marinara, which is delicious, I have also used Alfredo sauce...alone, or mixed with spaghetti sauce for pink Alfredo. Delish! I made it tonight and used chicken sausage and kale ravioli from costco. Was amazing. Thanks for the recipe. This is a great recipe, one of my new go-to favorites! I include a layer of zucchini in the middle (on top of the first round of rav's) to add some veggies; pre-sliced zucchini from the freezer aisle works perfect. I plan on making this tonight, but my family doesn't eat any kind of red sauce so we will be using Alfredo. I am also adding shredded chicken from last nights left overs! I just made this for supper and I really enjoyed it. It's great to have something "homemade" (ish) mid-week when you almost feel too busy and tired to cook. I really love this! It's my new fave! Thanks for a great and EASY recipe! Excellent and easy! Love it! 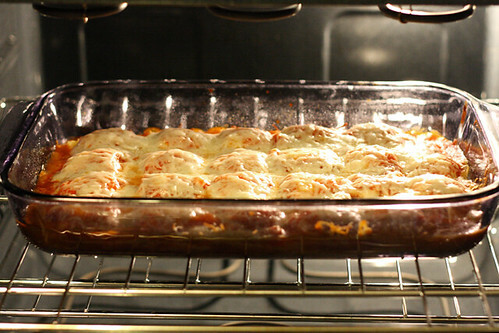 if putting ground beef in with the sauce, won't it be too tough when it's in oven for 45 min? can't imagine I put it in raw. I love it, hubby loves it! This is now a go-to recipe for finals/busy work weeks! Thanks for sharing! Making this tonight! Can't wait to see how it turns out. I also added farm rich brand meatballs. And used ragu spaghetti sauce. I've made this twice and it's great! I'm going to make this tonight. I am going to add little forze meatballs. I''ll let u know how it works out. Looks great! We'll be sharing this as an easy, shortcut, family dinner recipe on our blog! I'm DEF trying this, my dad & kids love anything with marinara sauce, especially my lasagna and this is more affordable and quick. Looks wonderful. Too bad you can't freeze left overs, since the ravioli was once frozen. But I will still try this. Just have to send home the leftovers. This was a great meal! Super easy and tasted amazing! This is a definite YES! at our house. I've made it with the cheese ravioli & with the meat ravioli. Now I use both! Divided down the middle. Added fresh basil & oregano tonight. Can't wait to try it again! I also use more sauce as well. Delicious! Quick question Do you cook the frozen ravioli first, before putting in the pan and then in the oven? You keep them frozen. Made this several times delish. I am a 25 year old stay at home mom to the most adorable 3 year old little boy and a wife of 4 years to the most amazing guy in the world. I am a horrible house wife, a wanna be photographer and a sucker for a good movie. 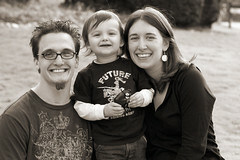 Z is a spunky little kid who is loving life as a three year old. He loves fruit hates vegetables and enjoys all Pixar movies!